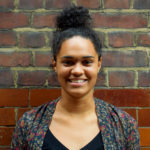 Tiria is Just Love’s North West Coordinator based in Liverpool. While at university in Liverpool, she was involved in setting up a Just Love group and graduated with a degree in History. Tiria now works with the group in Manchester, helps support new groups to get started and runs our social media. Usually dressed from head to toe in charity shop garments, Tiria can be found sipping on a cheeky chai latte in a coffee shop, making friends with people on public transport, and cutting shapes on the dancefloor.